The Reef delivers exactly what it promises in the trailer, nothing more and nothing less. It is the story, based on true events, of a group of five people who go out on a week long sailing trip around the Great Barrier Reef. Suddenly on the morning of the second day the boat flips and upon assessing the situation they realize they have a choice to make: either stay on the sinking hull of the boat and hope that help arrives, or risk swimming to land. Those that decide to swim soon realize they are being stalked by a huge shark, and like any good thriller film they are picked off one by one. 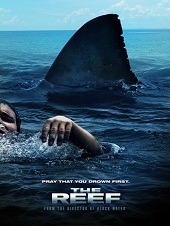 While the movie doesn't focus quite as much on the reef as one would expect from a film with this title, it is good to see a quality Australian produced thriller film. This film won't change your life (though it will make you reconsider ever swimming in the ocean again) but it is an easy way to spend 94 minutes. While it has obviously been made on a smaller budget than many Hollywood thrillers, the money has been spent wisely, with the amazing locations allowing for some incredibly beautiful shots. The focus on good actors and a decent script, with complex relationships between characters makes it better than the average thriller film. Although Suzie (Adrienne Pickering) spends a lot of time screaming and Matt (Gyton Grantley) has some shockingly bad lines to deliver the film, overall, is fun and lighthearted. The biggest problem is the limited scope. Beyond the first 30 minutes of the film, the constrained location doesn't allow for very much variation, and it can feel a little repetitive at times. The shot of Luke (Damien Walshe-Howling) looking underwater for the shark felt as if it was repeated every single time the prospect of the shark being around came up. While this was necessary in order to distract from the fact that they didn't have the budget to get a realistic looking shark, let alone a shot of it attacking someone, and it allowed for underwater shots of thrashing water to signify the shark attack, it does make you feel as if you've lived through certain sections of the film before. This repetition detreacts but ultimately the suspense is built up in a clever way - through the use of foreboding music and significant shots - and it is sustained right until the end. Anybody who enjoys watching quality Australian films or thriller films will enjoy this film. It isn't perfect, but an impressive effort considering the relatively small $3.5 million budget. The director/writer/producer Andrew Traucki was clearly aware of the budgetary constraints and found clever ways to get around them. As Australians we should be supporting films like this, encouraging more films to be made in Australia by Australians. As it is right now we have an industry dominated by Hollywood films. We don't see enough quality Australian productions, and that's a shame.